Bashka Paeff (1894-1979) was an American sculptor active near Boston, Massachusetts. Paeff was born in Minsk, Russia, and emigrated to the United States as an infant. In 1914 she attended the School of the Museum of Fine Arts, Boston, where she studied with Bela Pratt, and was sometimes called the "Subway sculptor" because she worked at Boston's Park Street T station. Later she worked at the MacDowell Colony in New Hampshire, and subsequently married Samuel Montefiore Waxman, Professor of Romance Languages at Boston University. Today Paeff is perhaps best known for the Maine Sailors and Soldiers Memorial on Route 1 crossing from Portsmouth, New Hampshire into Kittery, Maine. Its creation was marred by some political controversy. She received her commission in 1924 from Governor Percival P. Baxter, but in 1925 his replacement, Governor Ralph Brewster, rejected the piece as overly pacifist. Minor changes accommodated both men, and the revised sculpture was installed in 1926. 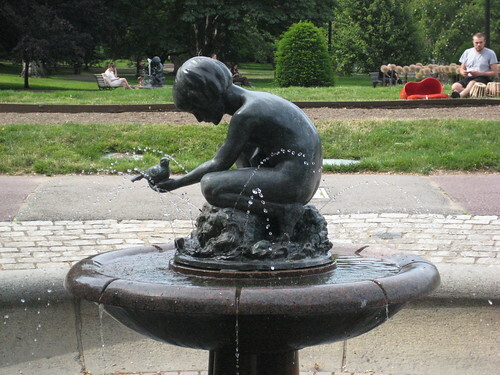 Other notable pieces by Paeff include a fountain sculpture of a small boy with bird at the Boston Public Garden (Arlington Street entrance), a statue of Warren G. Harding's pet Airedale at the Smithsonian Institution, a bas relief of Ellen Swallow Richards at the Massachusetts Institute of Technology, and a relief depicting the Battle of Lexington near Buckman Tavern in Lexington, Massachusetts.